This is only the title because today is Saturday. Self love should be practiced E.V.E.R.Y. (damn) D.A.Y. 2018 is going to be a crazy, hectic, beautiful, AWESOME year. But there’s a LOT going on. I am trying to make it a priority to take care of myself, mentally, physically, emotionally. I’ve been looking into *simple* ways to practice self-love and self-care. I don’t want to add to my list of things to do, so I’m really keeping this simplistic. I will create another post about some of what else I’m incorporating into my routine, but I wanted to first tell you about this one because I’m obsessedddddd…. 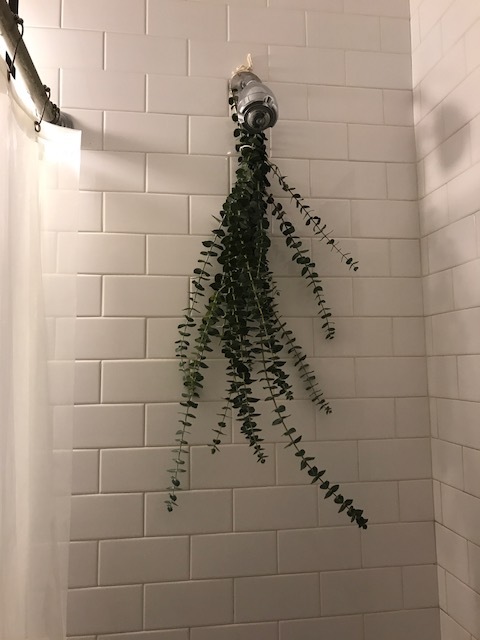 I bought fresh eucalyptus, from my local Trader Joe’s ($2.99), and hung it in the shower. Walking out of the store I couldn’t help but keep leaning into the bag for a few sniffs – this plant is heavenly! I used twine – 2 pieces: one to tie the bundle together, and the second to hang it in our shower. Try to hang it just behind the shower head, out of the way of the water flow. It should stay good for 1-2 weeks. On top of the benefits, it adds a “spa-like” feel to your home. Please note that eucalyptus oil is toxic to dogs. Don’t leave your dog around this plant if he/she may try to chew it. Do something for yourself today. And tomorrow. Do something for yourself every (damn) day. Previous Post Anybody still here? He likes it. And it’s beautiful too.